Good Morning America: Washington Independence: Are you THAT stupid or what? COFFEE, TEA, OPINIONS BY ME. These thoughts are from an average person, not a paid professional writer, or a computer geek purist, just thoughts from a common everyday folk perspective. Washington Independence: Are you THAT stupid or what? I'm reading: Washington Independence: Are you THAT stupid or what?Tweet this! David Weigel's bias is hard at work for the Washington Independence. This condescending attitude rankles me even when in writing. Weigel of the Washington Independence found a poll on Fox News and wrote a blurb about it's findings. He seems so -- surprised that the American public isn't as under informed as some segments of American society would like us to be. From a Fox News Poll Headline: Most Blame Bush for Economy. First sentence: Here's a somewhat surprising result from the new Fox News poll. Asked which President is "more responsible for the current state of the economy," only 18% say President Obama. Well now, how stupid does the Washington Independence believe the American public to be? Republicans are the only subgroup of voters who blame Obama. Oh Really! Well I wonder; just why is that? Republicans blaming Democrats or visa versa for problems -- 'splain it to me, in the simplest of simple terms -- Lucy! Bush was President for 8 years. During those 8 -- terribly, terribly, long years -- he systematically dismantled the American economy all for the sake of the "good ole' boys network". You do know who I mean -- those good ole' fellas at the top 10 of 1% socioeconomic scale, those who actually pull the strings of this country. Back during the Bush Administration, Obama was no where near the White House. 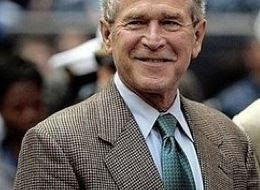 It was just Bush number 2 with his Daddy probably lurking somewhere in the background. Obama has been President for less than 1, count 'em [use your fingers if you have to] but count 'em <1 year. So, why oh, WHY are you, at the Washington Independence [gasp!] surprised? Doesn't your brand of media believe that the American people have enough cognitive prowess to intelligently figure out who's to blame. Don't you think that we know, all the way down to our pea-pickn' lil' hearts, that Bush was most certainly the one to orchestrate this American economic fiasco. Of course when the Democrats gain control of the White House a mess will have to be cleaned up. No one can clean 8 years of mess within 8 months. Does your paper or any of the other media of your ilk, truly think that "we, the people" of America are so bare foot, nose pickn', hoot'en-nanny stupid that we can't figure things out. I don't know about anyone else who's read your rag, but I view the article as an insult to the average American's intelligence. Some of you professional writers, journalists, news whores, which ever the case maybe, are under the misguided impression that the average American, must sit at the dinner table with our feet comfortably, propped while we use our toes to eat and pick our teeth. Moved on to slywy.com - I couldn't keep up updating in two places, so the party (what little there was) was moved here. Maj. Hasan: What Have You Done! Excuse me -- PhoneScoop, where's . . .
A Baby Boomer by birth, with lots to say. Political views voiced can go either way, not a die-hard political follower but, when something irks me...gloves are off. I'm neither Democrat nor Republican, both sides tend to irritate me.When I vote, I vote for the lesser of the two evils or I'll vote for my self. As a Disabled Veteran I've traveled the world, now I'm traveling along cyberspace and blog what I say and say what I blog -- simple as that. Come and converse with me -- you know you want too! I blog what I say and say what I blog -- simple as that All rights reserved with anything written by me.